The rosters for the 81st Texas League All-Star Game were released Wednesday afternoon by league President Tim Purpura, and the Tulsa Drillers were well-represented. 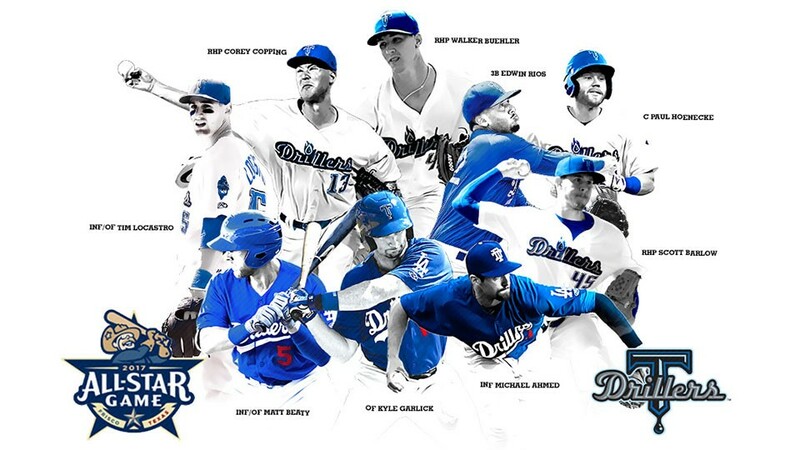 For the second straight season, the Drillers had nine players voted onto the North Division roster, giving them the highest number of participants of any team in the league. The Arkansas Travelers had the next highest total in the North Division with six players voted in, while the host Frisco RoughRiders and Corpus Christi Hooks tied for the most players named to the South Division roster with seven apiece. This year's game will be played on Tuesday, June 27 at Frisco's Dr Pepper Ballpark. There were six Tulsa position players voted onto the club, along with three pitchers. Edwin Rios, Paul Hoenecke, Michael Ahmed, Matt Beaty, Tim Locastro and Kyle Garlick were selected on the position player side of things while Scott Barlow, Walker Buehler and Corey Copping were chosen from the Drillers pitching staff. Tulsa is currently set to have two players in the starting lineup with Rios and Ahmed representing the club for the North. The starting pitcher for the contest has not yet been determined. NOTE: Since the original release, Edward Paredes and Jose Miguel Fernandez were also selected to the All-Star squad as replacements for Barlow and Garlick due to them not being able to participate in the contest. Rios leads the Drillers in batting average (.332), home runs (12), RBI (48), doubles (16) and slugging percentage (.562) while Ahmed has batted a solid .292 with 6 homers and 19 RBI. Ahmed is also second on the club with his .509 slugging percentage while playing all four infield positions. Garlick will likely not be able to participate in the All-Star Game due to a hand injury he sustained at the end of last month, but he was selected due to his outstanding production prior to his injury. The Tulsa outfielder still ranks second on the Drillers with his 11 homers and third with his 27 RBI despite only playing in 43 ballgames. Locastro has been a sparkplug for Tulsa as he has batted .275 with a team-leading 12 stolen bases while playing shortstop, second base and centerfield. Beaty has also been a solid utility player as he is third on the club with his .297 average while playing at first base, second base, third base and the outfield. Hoenecke rounded out the position player side of things as he has played catcher, first base and third base while clubbing seven homers this season. On the pitching side of things, Barlow was selected for the second straight year as he leads Tulsa starters with his 2.09 ERA while averaging over a strikeout per inning. Buehler made his first appearance for the Drillers on May 12 after dominating at Rancho Cucamonga and has made a strong first impression with a 2.91 ERA over his first five Double-A starts while limiting opposing hitters to a .244 average. Buehler is also ranked as the Los Angeles Dodgers #4 overall prospect and is the second-highest ranked prospect in the Texas League All-Star Game, behind Frisco's Yohander Mendez, as he is rated as the 81st overall prospect in the minors by MLB.com. Copping rounds out the Drillers representatives as the former University of Oklahoma hurler has held opponents to a .193 batting average with a team-leading 5 saves to go with a stellar 2.18 ERA over 22 appearances. Members for the All-Star teams are determined by voting from league managers, coaches and media members. Complete rosters for both teams are listed below. Both rosters are subject to change on account of transactions, injuries and player availability. Participants for the Home Run Derby will be announced at a later time. For a printable version of the current All-Star rosters, click HERE.